My Danielote is really into medieval times, and loves anything caslte-y and ruins. I just love views, the city or the country-side. I’m also a big fan of choppy seas. So we had a few days away in Cornwall searching for King Arthur, and September winds always make for dramatic landscapes. We made a base in the Alderberry Lodge in Newquay, and spent four days exploring this little corner of the UK. We were so lucky with the weather, only raining when we were back at the B&B or in the car. 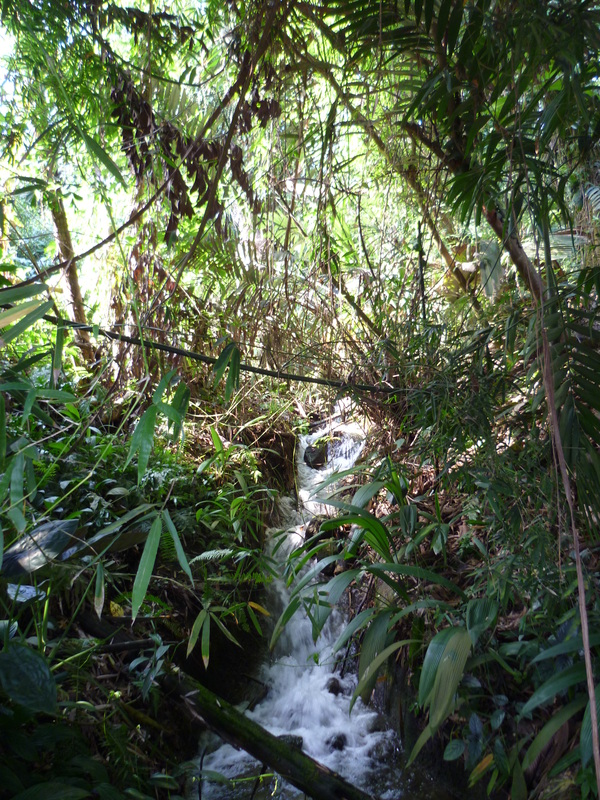 After three and a half hours driving we started with sweltering to death at the Eden Project‘s tropical rainforest dome. It’s an amazing place, and to be honest it probably wouldn’t have mattered if it was raining because everything worth looking at is inside. There are a lot of games and things for children and beautiful flowers and environmental displays and activities. It was a bit pricey though, so I would look out for offers, we got 40% off the tickets by booking the night before. That night we had a wander round Newquay, and of course ended up in the amusement arcades, these small sea-side towns are full of them! We only spent about a fiver but had great fun on the 2p slot machines and air hockey! Amazon jungle, or glass dome in Cornwall? Boscastle – Apparently this little town was devastated by floods back in 2004, so the town became a bit of a curiosity. We had fun climbing the cliffs around the harbour and watching the sea come crashing in. Tintagel – Birthplace of King Arthur, the castle itself is owned by English Heritage, so it cost about £6.00 each to get in, but the views from the top are well worth it. One word of warning though, it’s very steep, and very open at the top. I wouldn’t like to do it in miserable weather. There’s not much left of the castle itself, and I think if you had a guidebook it would give a bit more explanation than the free map we had. Another warning, take the main road, the A39, not the B3314, you’ll meet a very steep hill at Delabole! Padstow – I stayed here with my family about twenty years ago, when we were very young. It was lovely though because it felt like I was discovering it again for the first time. There are several restaurants and shops belonging to Rick Stein (of Rick Stein in India fame), we tried to get a late lunch of fish and chips at his place, after a lot of finding (it’s not really in the centre of Padstow), it was closed! Cue a lot of swearing and annoyance at Rick Stein personally.There’s a deli though, and a big expensive restaurant on the harbour front. 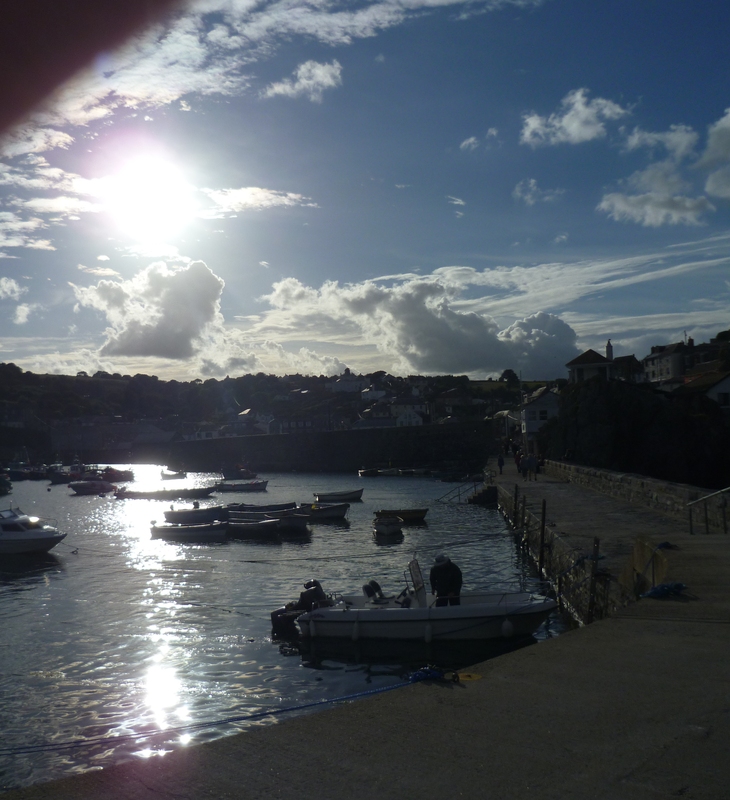 St Ives – Wonderfully beautiful little town, unfortunately our photos didn’t do it justice. We spent six hours here, with a fish and chips lunch, in a restaurant because it was a bit cold to eat outside. In hindsight we should have stayed here. There’s a really old pub on the front, The Sloop Inn, with local ales and a little beer garden by the harbour. There are walks along the beach and the town is full of little local craft shops, as well as the usual neon beach supplies and surfing shops. Mevagissey – We arrived here a bit late to enjoy this village in all it’s glory, but it’s beautiful in the evening. There are two harbour areas and the view back to the town is so pretty. We ate at a Portuguese restaurant that had lovely food, but no flexibility on the menu – all I wanted was two starters instead of a main but that wasn’t allowed. Clovelly – In Devon on the way home, you have to park at the top of the hill, pay £6.50 to roll down the hill to the harbour and have a heart attack climbing back up. There is a Landrover service that offers rides to tourists for £2.50 each way, so we left that and took the cardiac option. It’s lovely and quaint but not much to do once you’re down there, we walked along the beach to the waterfall, just wear some good shoes because it’s all stones, and some of them are not very solid underfoot. Appledore – In Devon again, the Guidebook made it out to be a colourful village by the beach, but in real life it’s an estuary and not a lot of shops or pubs. This entry was posted in Life, Love and Football and tagged alvorada, appledore, boscastle, clovelly, cornwall, devon, eden project, holiday, king arthur, landscape, medieval, mevagissey, newquay, padstow, rick stein, september, st ives, sunset, tintagel. Bookmark the permalink.